The tH is the hardness of your water, which is based on the concentration of calcium. It is measured in French degrees (°F) and the ideal reading is between 10°F and 20°F. In summary the higher the tH the harder the water, that is to say the higher the concentration of calcium. On the other hand the weaker it is the softer the water. Limescale is deposited on the walls, it creates white/grey stains and then it can clog up your filter. Furthermore this can also cause irritation for the eyes and skin of swimmers. First of all, just because we call it “soft” does not mean that there’s nothing that needs doing. 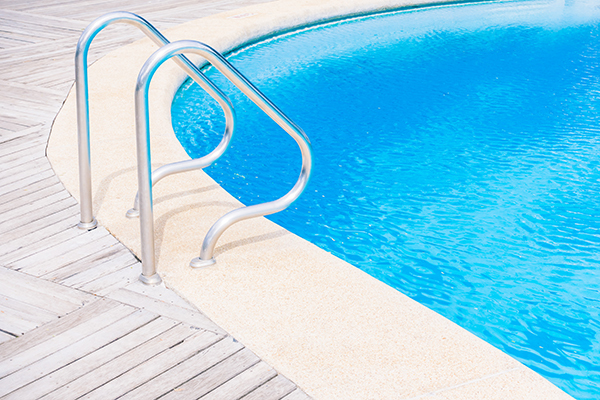 It can corrode metal parts of your pool (such as the shutter or stairs), it also can irritate your eyes. Finally it can lead to the corrosion of concrete walls. How to control the tH of your pool ? With hard water (higher than 20°F) : First of all, note that a high water temperature favors the build up of limescale. Secondly, control the pH so it is between 7.2 and 7.4. To finish, if you can, add some sequestrant to slow down the build up of limescale. With soft water ( lower than 10°F) : Use a product to increase the tH so that it is above 15°F and then adjust the pH of your pool. Of a high pH: The water can become murky following the build up of limescale in your pool. There will also be an inefficiency products used to treat the water. How to control the pH of your pool ? If it is too high (8 to 14) : Use a pH minus product following the dosage provided on the packet. After having put it in the water, wait for a few hours (6 min.) before testing the pH of your water. If it is too low (between 0 and 6) : Acidic water is uncomfortable to swim in. However if you use a pH plus product you will be able to restore the pH. During this process, make sure that your filter is working and you wait 6 hours before testing the pH. To conclude, check the quality of water in your pool regularly to be able to act in time to be able to make the most of your swims. I am ICO, your connected island which measures, anticipate and changes your advice and lets you know on your smartphone. Thanks to my sensors, I give you the following information directly through your smartphone : pH through the blue sensor, Redox (rate of disinfectant, estimation of chlorine level) through the orange sensor and the conductivity through the grey sensor. I also provide other estimations like salt level and alkalinity (TAC).